which still is succeeded. 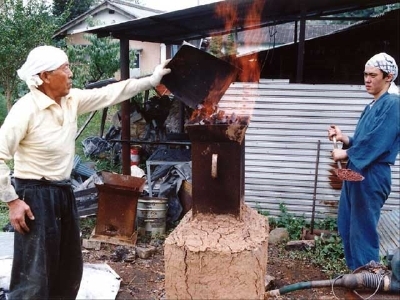 “Tatara” is the name of an iron reducing furnace assembled with soil and bricks. Charcoal is burnt in “Tatara” to raise the inner temperature up to about 1500℃. Iron sand and iron ore are put in Tatara to be reduced to iron. The iron made by Tatara is called Watetsu（和鉄）or Wakoh（和鋼）, the only approved material for KATANA. And we can reduce the Watetsu and Wakoh from all kind of iron sand and ore in the world by the Tatara method. The “Tatara” in the photograph is called Kanemasa type, his original. It is called “Small Tatara” because of its size. What is Watetsu or Wakoh ? Copyright © 2005 KANEMASA The KATANA smith All rights reserved.